Great news! From now on, all issues of the TUGboat except the current one are now publicly available for download. To tell this to as much TeX users as possible, I posted this plus download links and additional information here: on TeX StackExchange. English: (La)TeX Usergroup Berlin meeting Feb 14, this time with talk about simple structure for bachelor/master thesis with bibliography and visual studio code for LaTeX, plus git as version control system. Why do I mention it? Because it’s interesting to read about TeX and LaTeX in general IT media, and comments by IT people can be quite entertaining, such as the usual rants of guys who used LaTeX fifteen or more years ago and still complain about old stuff without having seen how it developed in the meantime. A declaration of love to the em dash: Regarding the Em Dash. And a discussion on using the em dash and other punctuation, also considering TeX: on Hacker News. A DANTE / LaTeX team will organize a tent village with workshops at the SHA hackers camp in the Netherlands next week, 4th to 8th August 2017. 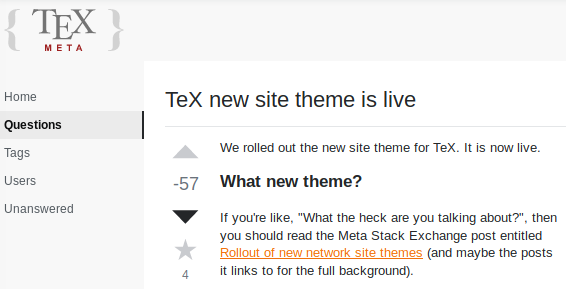 And of cause on the TeX Live homepage. Have fun!